Our cabins have beautiful views as they are nestled along a lake or tucked away under a lush timber canopy. With two different size cabin layouts, this allows for large family gatherings or a more intimate getaway for a smaller group. Throughout our different parks you will find a variety of several different activities such as wooded hiking/biking trails, swimming beaches, a fantastic lake for boating/skiing, river fishing, and an entertaining playground, as well as much more! Adding to the considerable recreation opportunities, Briggs Woods Golf Course doubles as our cross country ski course in the off season. Reservations: To make a reservation please visit our FACILITIES Tab. Standard size refrigerator, oven, microwave, coffee maker and table with chairs. 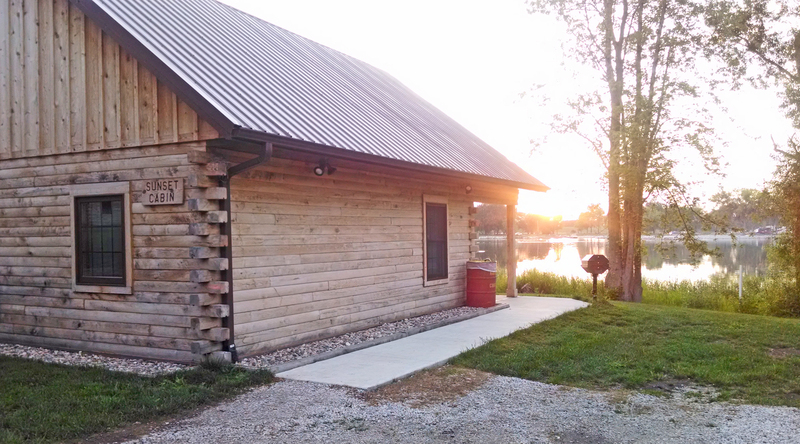 We also have 4 one room cabins available to rent located at Briggs Woods Park. There is no refund. Please review this policy prior to purchasing your facility reservation. Please understand that at the time of booking your reservation, you immediately prohibit other people from reserving & utilizing this facility - they therefore go elsewhere to locate a facility for that date. Reservations can be rescheduled up to 12 months from the original reservation date, so you will have a credit for 12 months and will be issued a code to use for your future online reservation. Cancellations or changes must be done 15 days in advance of rental. Travel conditions where a substantial risk is required in order to travel such as a winter storm where a travel advisory has been issued.